Inside an old, plain building in downtown San Jose, dozens of students are busy working on a futuristic transportation system. “We are inventing, developing, and demonstrating a new paradigm in urban transportation, sustainable urban transportation since our system is going to be 100 percent solar powered and grid tied,” said Burford “Buff” Furman, a mechanical engineering professor in the Charles W. Davidson College of Engineering, and head of the Sustainable Mobility System for Silicon Valley project. The goal is to design a personal rapid transit system using renewable energy. Students call it Spartan Superway. Four teams of students are designing and building a full-scale working model, a large tabletop model, and a mock-up of the interior cabin of one of the vehicles that will travel on the system. They’ll be displayed May 16-17 at the Maker Faire in San Mateo. The full-scale model includes a gondola-type pod that moves under the bottom of a 33-foot- long steel track suspended ten feet in the air. 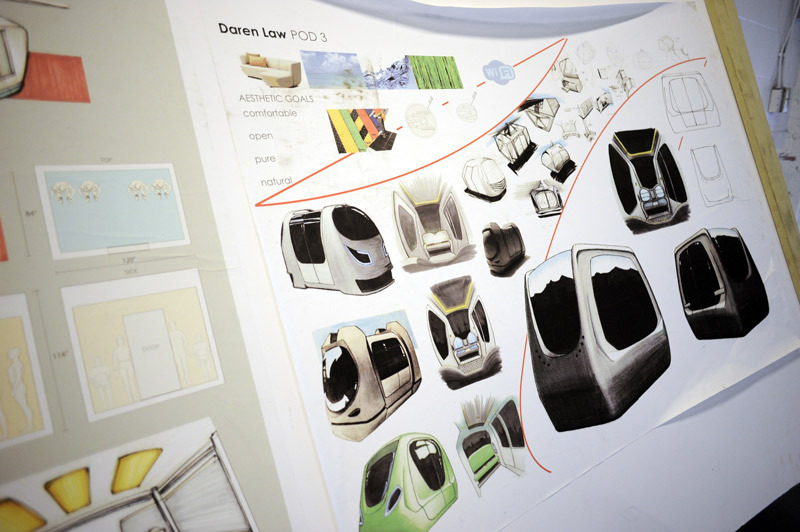 The pod rolls into a life-size transit station. Solar panels on top power the system, and excess energy is fed back to the electric grid. The project is made possible in part by SJSU former engineering professor Ron Swenson. He mentors the students, and supports the project through his 501(c)(3) non-profit organization: the International Institute of Sustainable Transportation. His brother, local builder Barry Swenson, donated use of the 9,000-square-foot building for three years, and friend Francis DeWinter provided most of the tools and a substantial part of the materials. The project started three years ago, but doesn’t yet have all the funding necessary to take it to the next level of development. “Getting funding is difficult because agencies are interested in funding paper studies instead of steel and concrete, which demonstrates concepts,” Professor Furman said. Jordan Carter, ’15 Mechanical Engineering, and lead of the cabin team, thinks the project is a great way to end her senior year. “This is something bigger, something ongoing, that’s not going to be done at the end of the year when I graduate, and I think it’s been really rewarding just to contribute,” Carter said. 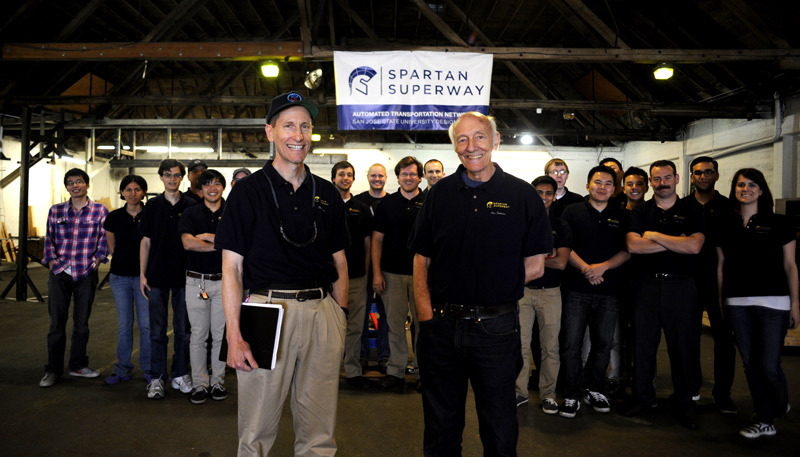 Spartan Superway may one day have an impact on transportation systems of the future. For now, its giving students skills that will put them in the driver’s seat as they begin their careers. Sounds like a great project!! How can I know more information about it? Come to the presentation at 1100-1200 in Engineering 339 on May 8th. The students will present about the whole project. Hi! I would really like to be part of the Spartan Superway project! I think what you guys are doing is great! I never liked sitting in traffic and I always wanted a faster and more sustainable transportation system compared to what we have today: the lightrail, caltrain, and bart. I am currently studying Business Management at San Jose State graduating this December 2015 but I did study both ME and EE until Junior year at Cal Poly SLO. Please let me join your team. I am very much interested in both renewable energy and public transportation and the fact that you guys combined both is just amazing! BTW I just had someone reach out to me with funding on LinkedIN because they thought I was in renewable energy already, so maybe I can help with that! We’d love to have you get involved. We have a huge summer research program on the Superway kicking off this summer. We need Business students to get involved!! !